Most of us depend on the news for weather predictions. We have easy access to the weather service. So what happens when it is no longer available and we have to depend on our own knowledge? In reality, there are some simple skills that our ancestors used to predict the weather. Suppose you are starting to cook breakfast over your open fire and you notice that the smoke is not rising but spreading out at a low altitude. This tells you that you have a temperature inversion. This creates a sandwich effect. Sound, light and radio waves bounce between the top of the cool lower layer of air and the ground. This means that sound and odors will carry further and it will affect radio transmissions. Radio waves especially VHF will bounce between the layers and travel further. This means you may be able to receive and transmit to radio stations that are hundreds of miles outside your normal range. An inversion can also be a sign that a storm is coming. 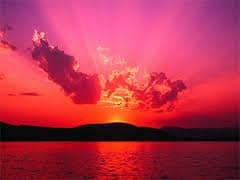 You have all heard the old saying Red sky at night, sailors delight; red sky in the morning, a sailors warning. Now this is not an wife’s tale, there is some truth behind it. A red sky in the morning can indicate that there is moisture in the sky and a storm is coming from the west. A ring around the sun and the moon is a result of ice crystals forming in the high cirrus clouds. This can often indicate that a storm is coming. Know the direction of the prevailing wind in your area. Changes in wind direction can be indicative of weather changes. There are old saying that were used by our ancestors for weather prediction. Upon study, they seem to have a basis in fact. A cow with tail to the west, makes weather the best; A cow with tail to the east, makes weather the least. Grey mists at dawn, The day will be warm. When human hair becomes limp, rain is near. When bees stay close to the hive, Rain is close by. Now remember when your grandmother used to complain that her arthritis was bothering her and she predicted rain. Many people with joint diseases, bad teeth, recently healed broken bones, and even corns and bunions report feeling aches as the barometer drops. Low barometric pressure often indicates that clouds and rain are on the way. 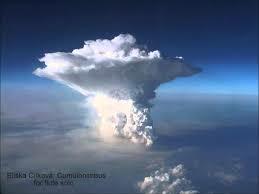 Now one of the biggest things to watch for is thunderheads, known as cumulonimbus. I am sure you have all seen these often in the afternoon. Be sure and pay attention to them, if you are caught out in it a thunderstorm, you are in danger from lightning strikes. Here is a post on how to avoid How to Avoid Lightning Strikes. 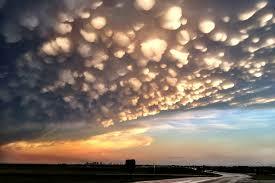 Thunderheads often turn into cumulonimbus mammatus which are indicative of tornados. Take a good look at the picture of them and if you see them get to cover, the chance of a tornado is high. Animals can be a good indicator of changes in weather. Watch their coats, are they thicker than normal. Are ducks migrating early? Are the squirrels working harder than normal? None of these methods are as easy as turning on the radio, but if you take the time to learn them and start watching natures signs you can be reasonably good at weather prediction. How to Avoid Lightning Strikes. This entry was posted in Weather and tagged weather prediction. Bookmark the permalink. This is a subject that really concerns me. We won’t have the weather channel any more. I am glad you wrote this. I would really like some more ideas about weather prediction. The people from long ago made it with out the weather channel so I guess we can too. On occasion attributed to Benjamin Franklin, a wind from the south usually brings rain and precedes a cold front. When rain comes before the wind, halyards, sheets and braces mind, But when wind comes before rain, soon you may make sail again. But with the wind before the rain, your topsails you may set again. Winds occur when two masses of air of different pressure come into contact; for westerly prevailing winds in the Northern Hemisphere, winds before the rain indicated that the two masses of air are already in contact and thus the strong winds, with the rain following from the westerly winds. However, rain, prior to the winds, is indicative of westerly winds blowing to the east without yet reaching the weather front and creating a storm. Shoot your lines, nets and trawl. That is when the fishing’s best! When roaches fly… rain is near.